The Dholak is a barrel shaped hand drum originating in Northern India. It has two membranes on either side of the barrel, creating higher tones on the smaller end, and lower tones on the larger end. The smaller side has a simple, single layer membrane, where as the larger side has dholak masala (a composition of tar, clay and sand) attached to the inside of the single layer membrane, to lower the pitch and produce a well defined tone. The dholak can be tuned in two ways depending on the type of drum. The traditional dholak are laced with rope, so tuning is controlled by adjusted by a series of metal rings contolling tightness of the rope. Modern dholaks have metal turnbuckles which are easily adjusted for desired tone. The dholak is widely used in folk music of villages of India. It is common for folk musicians to build dholaks themselves from commonly available material. They then use the drums in musical rituals and special functions such as weddings, engagements and births. The dholak is played by two musicians. The first musician strikes the two membranes with their left and right hands. There are two basic playing techniques; the open hand method is for louder playing, while the controlled finger method is for articulate playing. There are a few different positions to play the dholak, but the most popular is squatting with the drum in front, the bass head on the left, and the treble head on the right. The second musician sits on the other side of the drum, facing the first musician. They strike the barrel with a hard object, such as a spoon or stick, giving rhythmic hits similar to a woodblock sound. The purpose of this project is to use technology to create a real-time instrument that models the Dholak. This Electronic Dholak (known as the EDholak) has digitizing sensors, custom positioned to traditional Dholak technique, which converts finger strikes to binary code which computers can recogize. These signals are then used to trigger real-time sound and graphics. We also wish to take advantage of the collaborative nature of the traditional drum and explore building a multiplayer networked controller. * Facilitate interaction of musicians in seperate locations using new musical controllers over a network. The design of the Electronic Dholak is inspired by the collaborative nature of the traditional drum. Two musicians play the EDholak, the first striking both heads of the double-sided drum, and the second keeping time with a �Digital Spoon� and manipulating the sounds of the first player with custom built controls on the barrel of the drum and in software. We further explored multiplayer controllers by networking three drummers playing two EDholaks at the two geographically diverse sites. Finger strikes are captured by five piezo sensors (three for the right hand and two for the left hand) which are stuck directly on the the EDholak�s drum skins. Sensors are placed in positions which correlate to tradional Indian drumming. The left drum-skin had captures Ga and Ka strokes, while the right hand drum-skin captures Na, Ta and Ti strokes. The Digital Spoon has a piezo sensor attached to the back of a flat wooden spoon. There is neoprene padding covering the piezo to keep the striking of the Digital Spoon acoustically quiet. The spoon player has the option of striking anywhere on the drum, or floor, triggering a audio/visual response, or striking on a linear force sensing resistor (FSR) on the EDholak Controller Box, which augments the audio/visual of the spoon strike and the audio/visual instances of all EDholak finger strikes. The Controller Box has a linear FSR and a knob which the spoon player can use with his left hand to augment all sounds/graphic instances. All piezo triggers are converted to MIDI by the Alesis D4 8-channel Drum trigger box. The Controller Box is built using a Parallax Basic Stamp which converts all sensor data to MIDI. When two EDholaks are used in distinct locations, MIDI signals are transferred using GIGAPOPR and then processed and then merged together by an Alesis D4. 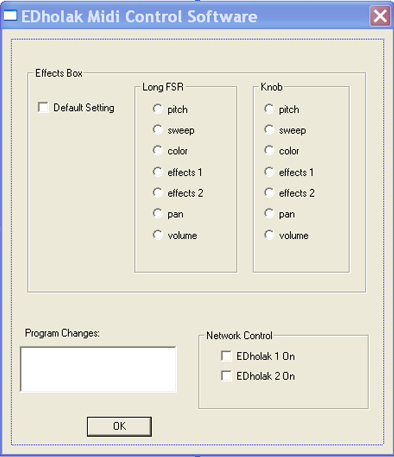 All MIDI messages get funneled to the EDholak MIDI Control Software written for Windows. This software is used by the spoon player to control many parameters of a performance. A user can toggle between a networked performance (two EDholaks sending MIDI messages) or just one. The software is custom built to communicate with Roland Handsonic. The user can pre-program patches which they wish to use in performance, in order of occurence, and simply use the mouse to switch between them during a concert. The software also gives maps the Control Box sensors (Knob, and FSR) to different MIDI Control Changes such as pitch, sweep, color, pan, and volume, augmenting sounds of piezo MIDI signals going to the HandSonic. All MIDI messages from the software get transmitted to veldt to trigger visual events. 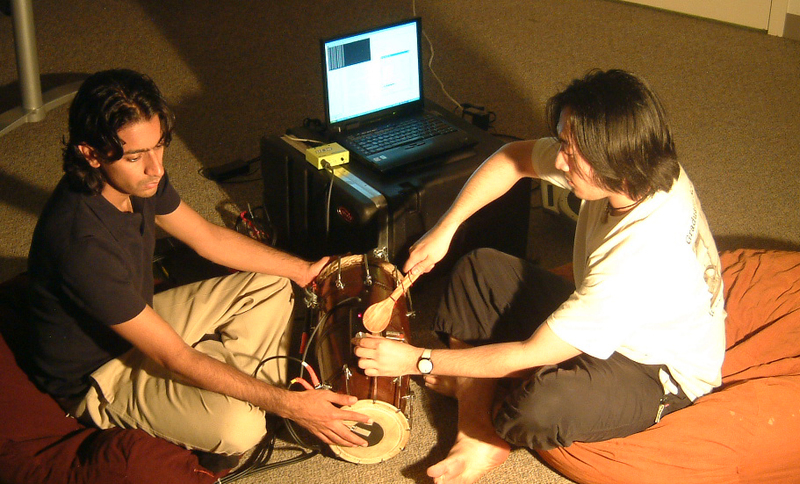 The EDholak world premiere was at New Interfaces for Musical Expression (NIME 2003), in a networked concert between Mcgill University (CANADA) and Princeton University (USA). The EDholak is featured in an excerpt from this networked performance, known as The Gigapop Ritual. Kapur, A., Davidson, P., Cook, P.R., Driessen, P.F., and W.A. Schloss. "Digitizing North Indian Performance", Proceedings of the International Computer Music Conference. Miami, Florida, November 1-7, 2004.